Three or four years ago George Palamara (btw, does someone know where is he now?) discovered a prototype HuCard for Tengen's Off the wall. The card was shown on his web site and also in several PCE fans meeting (see here: http://member.nifty.ne.jp/RhythmSift/pceside/e00tkoff.htm) and then disappeared together with its owner. What are the chances of dumping it for preservation purposes? Are other copies of these card available? He dropped out of the Turbo scene a LONG time ago. Who knows if he even owns it still. If he does though, at least its in the hands of a PCE fan. It´s my first post here. I am a french collector PC Engine. Ahh, so you're the owner of it . There are several prototypes for Off The Wall, I think about 4 or 5 protototypes exist with differents versions. I agree... i think dumping this is a great way to share the experience with all the PCE fanatics, and PCE historians alike. I have been thinking this ever since i first read about it, then saw videos(which i have saved on my PC), and wondered if the owner would ever be kind enough to do this for the PCE community. Mr. Thibaut, if you could be so kind, could you give it thought, an dpost here to let us know what you have come to conclusion with. Many thanks in advance, regardless of the outcome, for stepping up to the plate and letting us know you are the owner, and are in contact with us as to its whereabouts. My english is not very good, I don´t understand every word you are writting. I have pay a lot of money for this rare prototype. This prototytpe come from Tengen and I had signed a letter ".... never copy, dump,....." to Tengen. Sorry but I don´t want to make a dump. I'd love to get more coverage on Dino Force from those lucky collectors . I think we need to hire well-trained spies that can locate these Japanese collectors and give us all info possible on these obscured prototypes. I/we understand Thibaut. Thank you for you correspondance. Yes we DO need mroe articles on those other rare games!!! i do not know why they do not write articles on them. We appreciate anything we can get, see, or hear. So any effort, is appreciated! 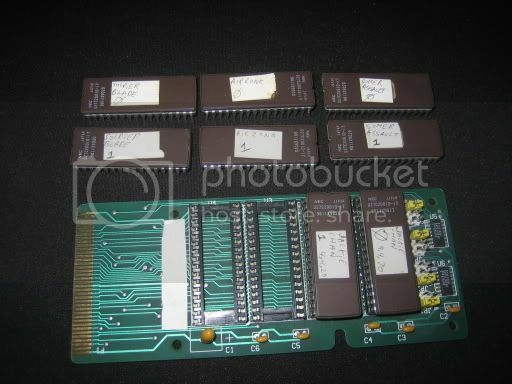 I found my proto board and EEPROM's. What are the name of those games please ?